Today’s is my daughter’s last day of school. Which means there’s a long summer ahead. My favorite thing to do during summer vacation when I was a kid was read. It was, for many summers, my primary activity. 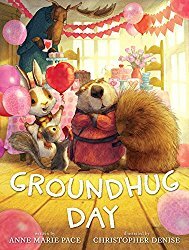 If you have small ones and want to start that same trend in your house, here’s a list of relatively recent picture books that would make for great summer reading — either as read-alouds from you or another adult or books your older children could read alone. Examples of story structure and good writing. Conversation starters about friendships, decision making, acceptance, being yourself and more. Introductions to historical or complex topics. Quick wins. Most can be quickly completed. And, before I get going on the list, I want to put in a plug for visiting your local public library to see what sort of summer reading program they have going on. Many libraries now offer programs for kids and adults. 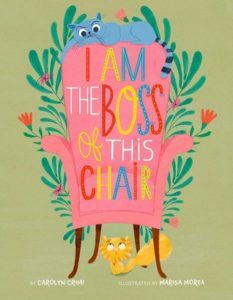 I AM THE BOSS OF THIS CHAIR by Carolyn Crimi and Marisa Morea. This is a delightful book about Oswald Minklehoff Honey Bunny III, an only cat who has staked his claim to certain household items, including a chair. But them Pom-Pom arrives. She’s a fluffball of a kitten, who commits the unthinkable offense of sleeping in Oswald’s favorite chair. Can two cats rule the roost? This book is a fun read-aloud, a true slice-of-life for any family with more than one cat — or kid — and really awesome artwork. 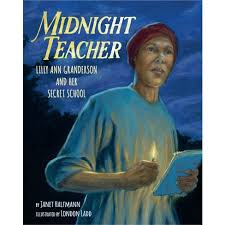 MIDNIGHT TEACHER by Janet Halfmann and London Ladd. One of my favorite things about picture book biographies is how they can introduce you to people you might never have learned about otherwise. In this book, you’ll meet Lilly Ann Granderson, who taught herself to read and write when she was a slave in Kentucky. She started secretly teacher other slave children even as she was sold from family to family and had to leave her own family behind. As an adult, she started a school at night to teach other slaves — at great risk because it was illegal for slaves to know how to read and write. You’ll find out what happened to Lilly and the impact she had on education. This is also a great book to talk to older kids about research and how the author found information about a person whose life wasn’t widely documented. THE WORD COLLECTOR by Peter Reynolds. This book is a love letter to words. It follows the adventures of Jerome, who collects words the way some children collect comic books, rocks or coins. When I was a kid, I sometimes stopped reading books temporarily just because I was so overcome by the wonderful way the author had put words together. It’s like I needed a break to process how cool the language was before I kept reading. So this is my kind of book and Jerome is my kind of kid. 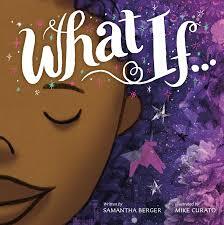 WHAT IF … by Samantha Berger and Mike Curato. This is an exuberant poem about a kid who makes things out of anything she can find and her all-consuming desire to create. It’s a great-read aloud in it’s own right and could easily be paired with a variety of craft projects for when kids are bored. It also has a great, fold-out page in the middle of the book and really interesting back matter about what led to the book’s creation and how the art was made. If you need more ideas, look back at previous Picture Book Builder posts or ask your local librarian. There are lots more splendid books that would love to spend part of the summer with you or your child. Pat Zietlow Miller, picture book, summer reading. Bookmark. Thank you for sharing – on my way to finding these books! Thank you, Pat! This is a great list, and I am off to my local library! Wishing you happy reading this summer. Thanks for the reading selections Pat! Thanks, Pat, for introducing me to these lovely books. I’m off to Barnes and Noble tomorrow! Thanks for the great reading list, Pat! I’ll be checking these out soon! Great list! Thanks! Happy summer! Looking forward to reading these. They look great! Some great suggestions! Thank you. I also read voraciously as a kid! (And STILL do! Even picture books!) My four kids inherited this love of reading, and my 5 grandkids are well on their way! 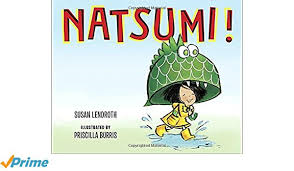 I love Natsumi! too. I foresee it could easily become a series, I hope I’m right! Thanks for sharing the other titles, too, all on order. A list of delightful books! Thanks!! Thank you Pat. What a great list. Hurrah for reading anytime but especially during the summer. And not just because it’s been proven to help kids retain more of what they learned during the school year. Reading chases away boredom, stimulates imagination, and best of all, it’s one of the best excuses I know to cuddle up and share some special time with the kids in your life. Great post, Pat.